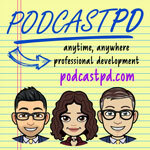 We continue our conversation from Episode 35, as we discuss the finer details of lesson planning: grabbing student attention and reflecting on the lesson. Determine if the lesson was successful; were goals accomplished? How do you know? What would/could you do differently?